The Lemare Property is composed of one block totaling 165 claims covering an area of 7,806.82 ha for over 20 kilometers in length in a SW-NE direction. It is contiguous to the Nisk property on its North West border. Secondary roads running from a Hydro-Québec power line and permanent gravel roads that run along its North West boundary give access all through the property. On February 11, 2016 the Company and Lepidico has entered into a binding agreement ("Agreement") that gives the right to Lepidico to acquire up to a 75% interest in the Lemare lithium project. 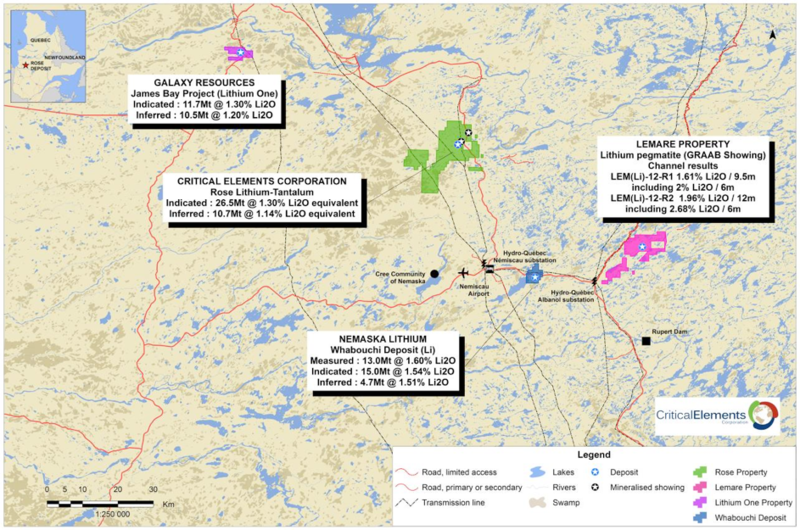 Initial exploration at Lemare was undertaken in 2012 by Monarques Resource Inc. who discovered a "granite pegmatite dyke containing a considerable amount of spodumene." The pegmatite ranges in apparent thickness from 4.8 to 14.2 metres and was followed for close to 200 metres in length on surface. The full length of the dyke remains unknown and is open in both directions. The pegmatite is undrilled so the depth extent also remains unknown. Figure 2. Location of the Lemare project claims in the James Bay area, Quebec, Canada. The Lac des Montagnes volcano-sedimentary formation crosses the Lemare Property in a NE direction. It is composed of paragneiss (gneiss formed of metamorphosed sediment), amphibolites and granitic intrusives. The North of the Lac des Montagnes formation is mainly composed by orthogneisses intruded by granites, while the South area of this formation is composed principally of paragneisses, also intruded by felsic to intermediate intrusives. The Lac de la Chlorite showing is hosted in a metabasalt with 10 to 15% arsenopyrite and returned gold values of 1.645 g/t, 0.726 g/t and 0.532 g/t. The Lac de la Sillimanite showing, having previously returned 4.7 g/t Au (Raymond, 2009) was resampled and three grab samples returned 0.877 g/t, 0.368 g/t and 0.125 g/t Au. On the target NI-8, quartz-tourmaline veins returned values of 0.33 and 0.23 g/t Au. SE of target NI-1, an outcrop of metasediment with 5% pyrite as returned 0.15 g/t Au. Two boulders in the area returned grades of 0.17 g/t and 0.09 g/t Au. To the east of Post Albanel, the Ancre showing located in the Lac Voirdye area, a grab sample in a mineralized metabasalt with 1% pyrite returned 0.53 g/t Au, 1.55 g/t Ag and 0.12% Cu. The possibility of nickel-copper-PGE mineralization is confirmed by the presence of Nisk-1 deposit, located close to the Lemare property. Several magnetic anomalies are present on the property and these have not been drill tested. The GRAAB showing, a spodumene pegmatite with an apparent thickness of 5 to 14 meters by 200 meters has been identified. A total of 43 samples have been gathered on 62 meters of channels. Among these samples, 11 show a Li2O content superior to 2%. This discovery proves that there is always a possibility to find new lithium pegmatites on the Lemare property. 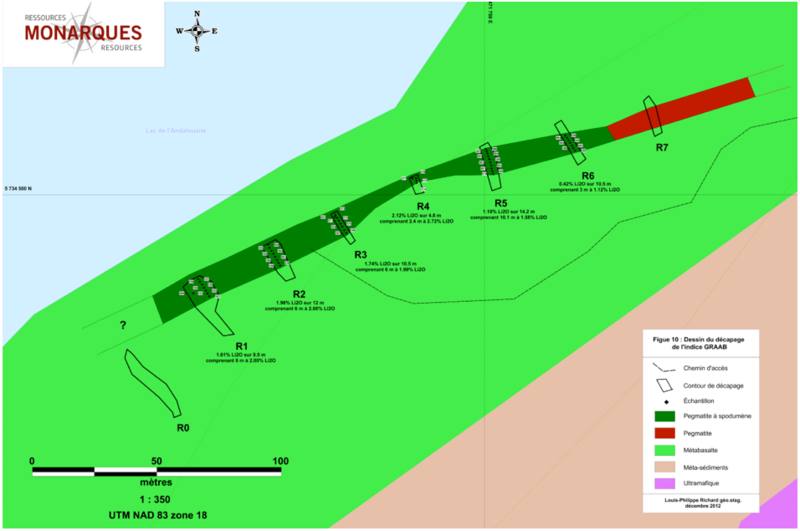 Lemare drilling reported to ASX on November 24, 2016 (under ASX code PLP).